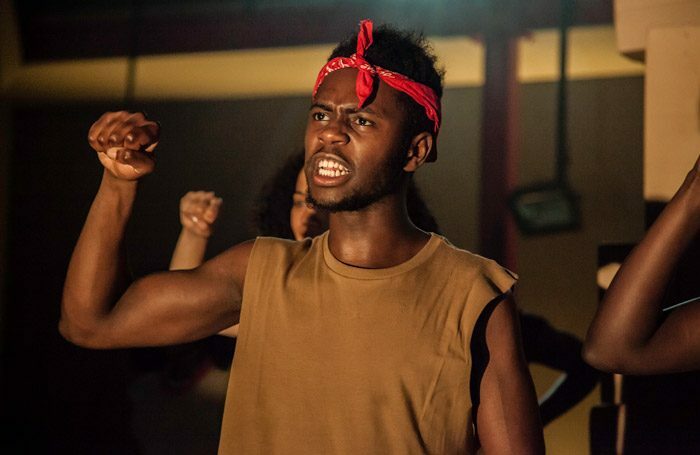 This raw, angry and powerful show by Talawa Theatre Company’s 2017 TYPT cohort – its flagship programme for theatremakers aged 18 to 25 – is a manifesto made for the stage. Starting out as a series of loose vignettes, from parables to everyday micro-aggressions, Bite Your Tongue uses poetry, gorgeous a cappella songs and dramatic sketches to examine movements such as Black Lives Matter and the sharp socio-political divisions of state housing policies in the wake of the Grenfell Tower tragedy. The energetic ensemble of 10, armed with a dozen empty cardboard boxes on an empty stage, pack an arsenal of ideas into a brief hour. Their insights move from unsophisticated soapboxing to a rich, complex and often very funny critique of the co-option of activist movements by commercial forces, and the policing of black bodies not just in physical spaces but virtual ones – and not just by white supremacists or an ignorant majority, but within the communities and safe spaces of home. The versatile cardboard boxes are worn by the actors over their heads. They light up, a potent metaphor for phone and computer screens, then slowly pile up to form an imposing but unstable, Jenga-esque tower looming over the cast, as the activist protagonists fight, and often fail, to stay united. Through the dissent, the frustration and their failures, a flicker of fierce hope remains – they never stay silent.